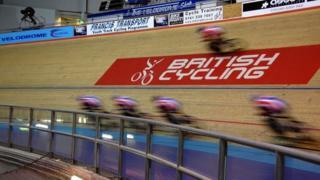 Cycling fans can own "a piece of history" as the track from the Manchester Velodrome is replaced. Thousands of planks of Siberian spruce that made up the National Cycling Centre track are being sold on by recycling charity Emerge. Interest among fans of cycling has been growing although British Cycling is keeping the start/finish line. It has been used by Team GB's greatest cyclists including Sir Chris Hoy, Dame Sarah Storey and Sir Bradley Wiggins. Emerge group director Lucy Danger said a queue of people had formed outside the charity's base at New Smithfield Market when it opened on Friday. "There's been a lot of interest from people who are into cycling, cycling groups and so on, since the word got out there," she added. "We've had people coming down saying they want to make a boardroom table, we've had someone say they're going to make a load of trophies from it for the British Cycling Federation. "And Laura Kenny has said that she wants a bench made out if it. "It's been an amazing project to be part of and to help people get their own piece of history." Wai Lee 36, from Manchester, a member of the Cheshire Mavericks cycle club, is one of those who has collected a piece. He said he wanted "a piece of Manchester history, plus the memory of riding on it makes it something special". "I think I'll turn it into some sort of wall art," he added. The wooden track was last replaced in 2007. Alistair Rutherford, 36, a Masters World Championship winner in the 2016 team pursuit and points race, said he started riding on the track in 1994 when it first opened and bought a piece for sentimental value. "Think of how many times I've crashed on that track," he said. "I'll put it on the wall. Put it in my man cave."